Here’s the official shout out to my FUTURE SISTER Yana! (in law? formalities…) This weekend was her Bridal Shower, a big joint effort on behalf of myself, my sister, and my aunt Sharon (BIG smiles Auntie Sharon, you’re FAMOUS) which means 56 days until the BIG day! But the reason we’re all here is for the baking my loves, and don’t worry I will not disappoint! 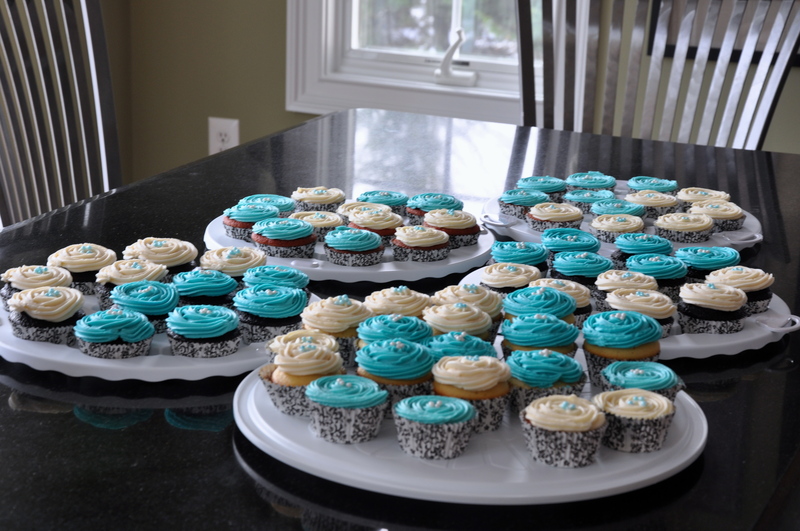 This was the MOST AMOUNT of baking/prepping/decorating I’ve ever done! Not to mention the previous evenings’ giant-cupcake-cake baking fiasco, which I wasn’t going to mention, but oh well. 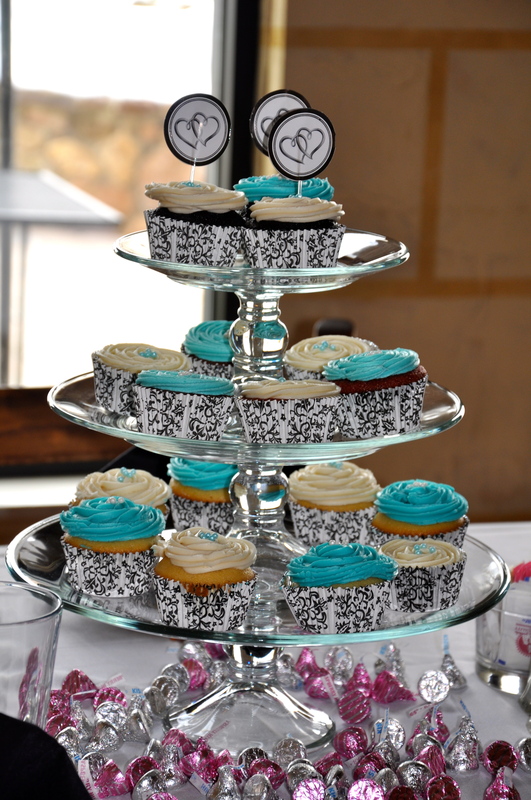 Glass tiers of cupcake goodness! All in all, my baking included 1 double batch of Sparkling Wine Pound Cake, for which I used flat wine by accident and it didn’t rise…big dismay. Those puppies came out of the oven at approximately 9:45 like solid dense rocks. Next, one batch of Sparkling Wine Pound Cake properly prepared, but during the baking process SOMEONE (the jury is still out on whom) turned off the oven as I put it in. The beginnings of rock-like cupcake cakes. So of course at this point I was a LITTLE ticked off at the cake and did one of those “I don’t want to look at it until the timer goes off.” It always works like that doesn’t it? So almost 11pm I take the cakes out of the oven… raw. THAT was fun. Baked again – and of course after sitting in a warm oven for an hour, they just weren’t right. I went to bed, and you know what? 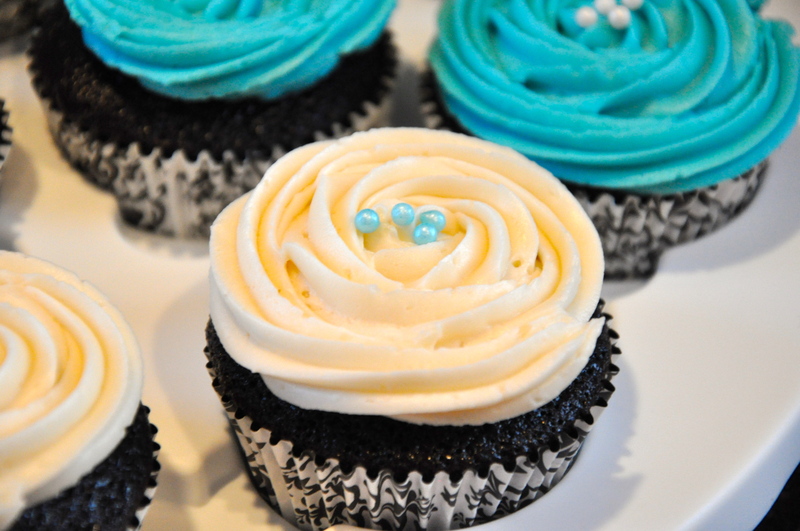 I dreamt of cupcakes. So I began my day with high ambitions. 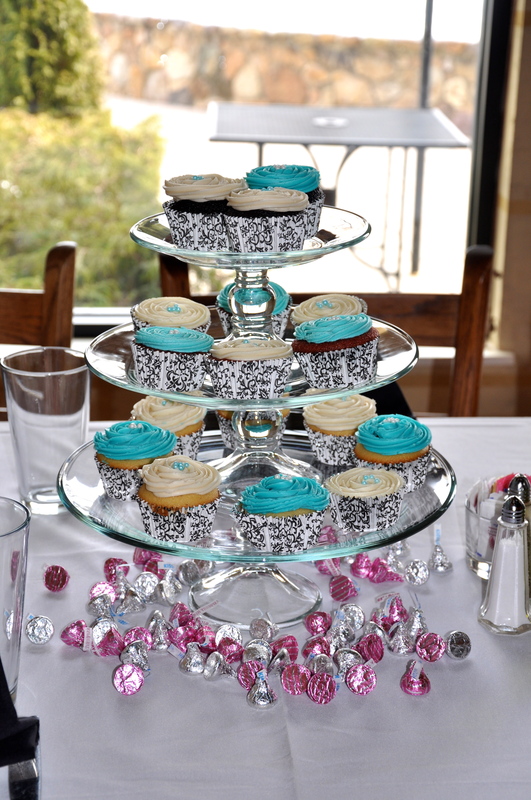 Four tables, four centerpieces and four and a half dozen cupcakes. And thank goodness, a whole day to prepare. Red Velvet Cupcakes with delicious cream cheese frosting; my famous chocolate cupcakes (are you guys sick of this yet?) and Sparkling Wine Pound Cake Cupcakes both with buttercream frosting. See below for the recipes! 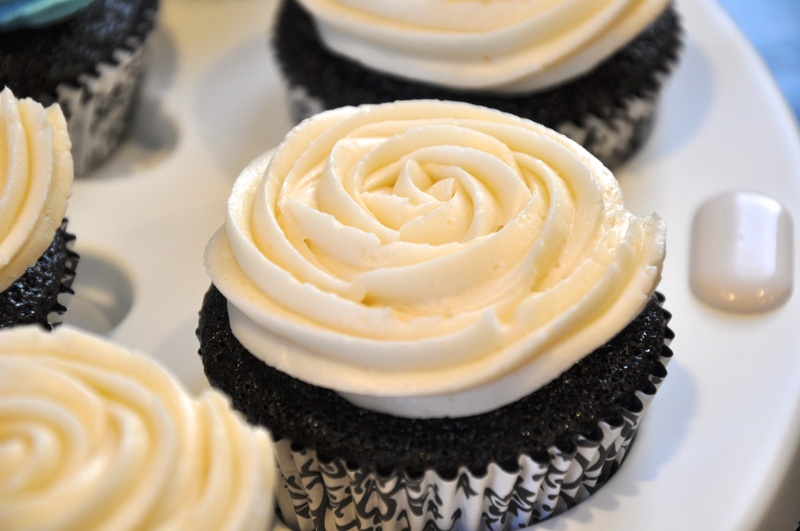 My new favorite way to frost cupcakes! I mixed up the flavors on the tables for the centerpieces to have various flavors at each table. I found 3 tiered glass centerpieces at Macy’s (I believe those are them!) which worked out perfectly! 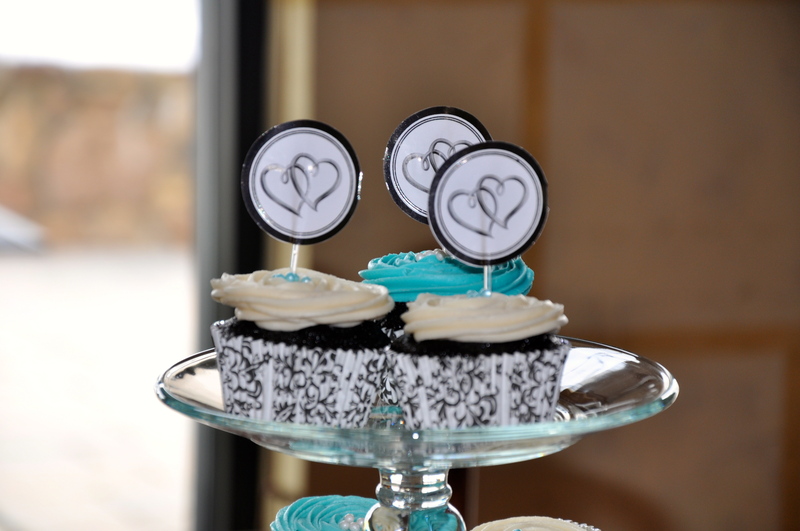 The wedding colors are a similar hue to the blue frosting from the cupcakes, hence why I did it. I’m just good like that. 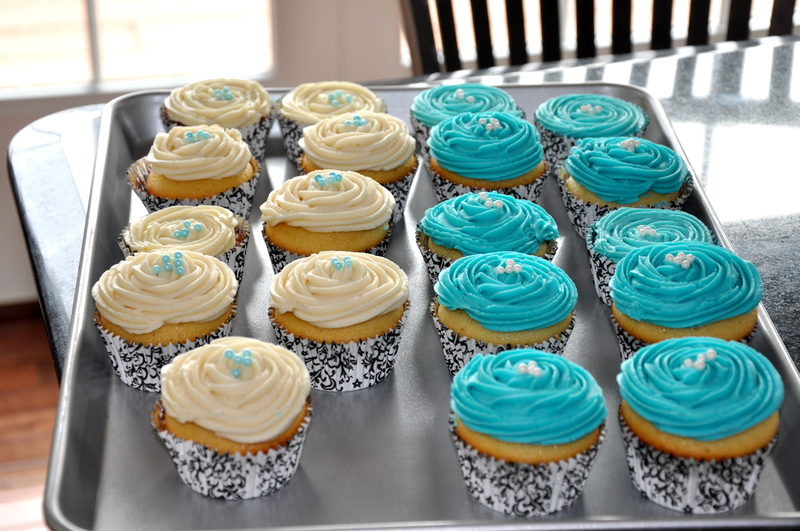 I experimented with less sugar for both the cream cheese and buttercream frosting, and you know what? I LOVED it. I’ve never been one for super sugary, so it might be a personal preference. Isn’t it ironic though, baker who doesn’t really enjoy sweets. I’ve always said, I’m a dark chocolate girl through and through, milk chocolate is so sweet it makes my teeth hurt. I ran out of containers after 4 dozen! 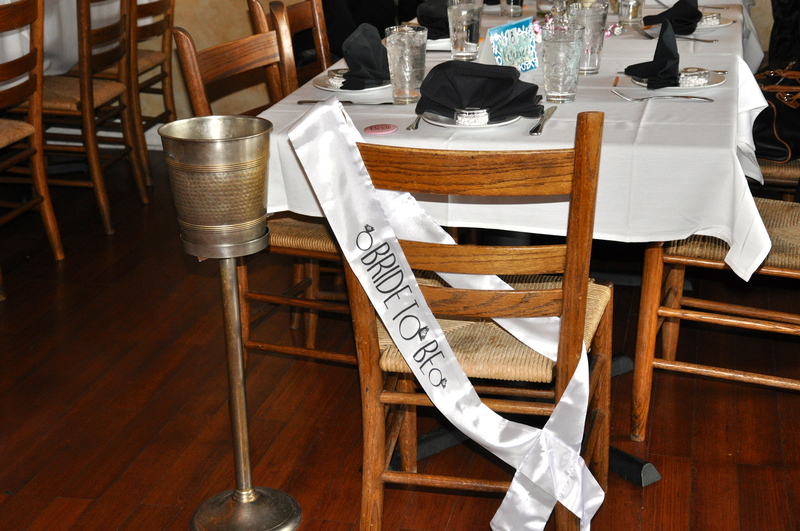 Hearts, it is a bridal shower after all! Pink and silver kisses for a dash of color! Recipes to follow! I feel that recently I’ve been posting nothing but my mistakes, but you know what? It’s invigorating! I’m really embracing my imperfections! Who would have thought I could do that? To be quite honest, I’m thrilled that I ended up making cupcakes, much easier for serving, taking leftovers home, and aesthetically pleasing. 1. Preheat oven to 350 degrees. 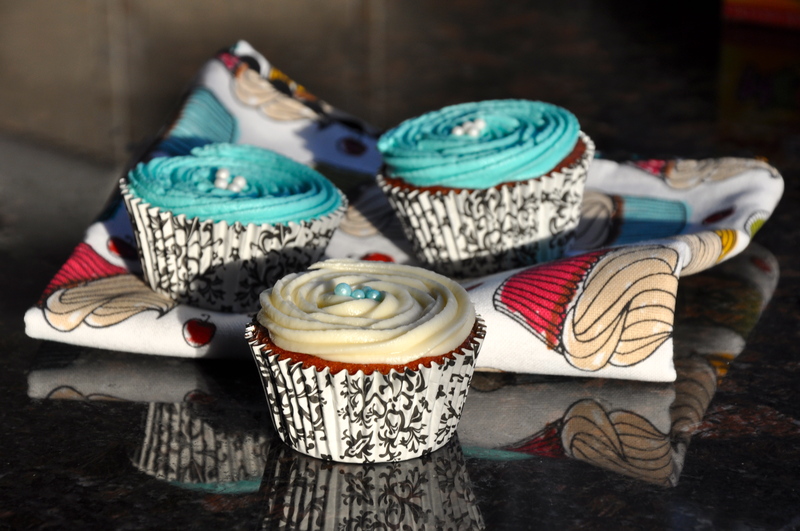 Line your cupcake tins with pretty papers! 2. Wisk eggs in small bowl. Add liquid ingredients and whisk until blended. 3. In stand mixer, place all the dry ingredients and combine. 4. Add wet ingredients to the dry, mix on medium-high for about a minute or until fully combined. 6. Bake for about 16 minutes (30 for a cake) or until it passes the toothpick test. 7. Try not to devour all at once. 1. Beat cream cheese and butter on high until creamy. Add vanilla. 2. Then, add sugar in batches. Scrape the sides of the bowl as you go. 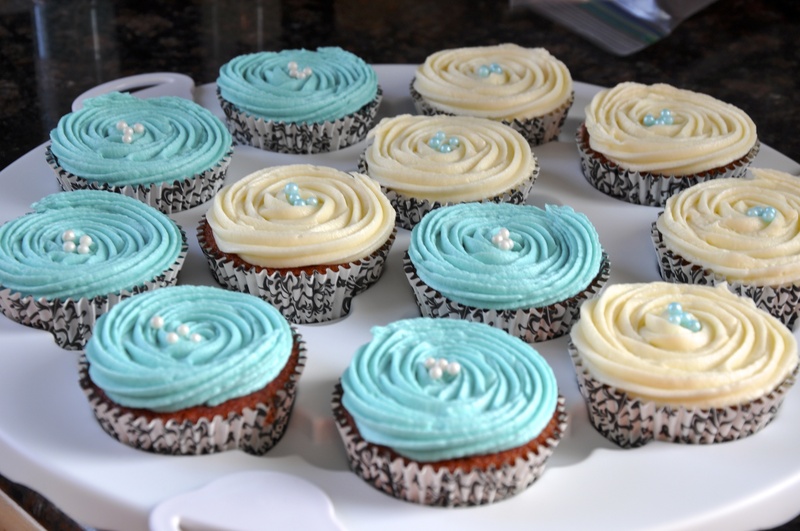 A trick of cream cheese frosting is to NOT OVER-BEAT! 1. This changed my world, the secret is definitely salted butter; that Kitchen Magpie is onto something! Whip the butter with a paddle in the stand mixer; until fluffy and very light in color. 2. Add in the confectioners sugar. 3. Next add in the creamer. Not cream, CREAMER. I used 3ish tablespoons, adjust to what you want. 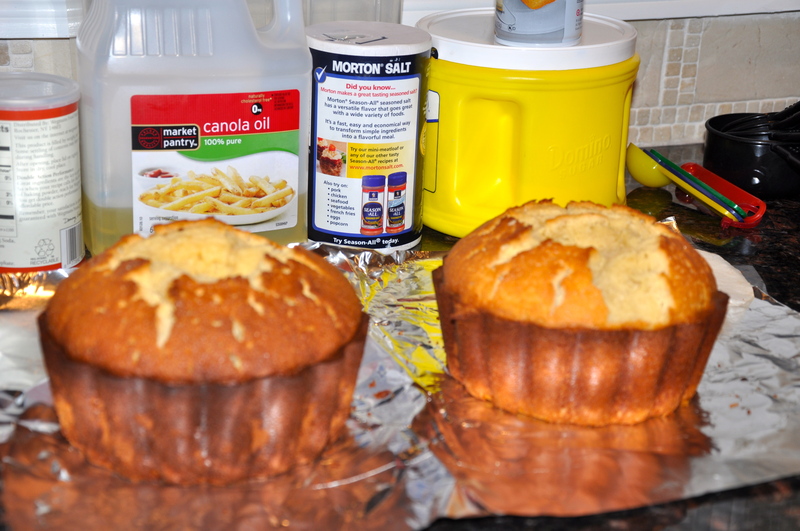 for a lighter whippier icing use more cream, less for a stiffer icing. MIX. 4. Add vanilla and mix until desired texture.